Head to the Ferry Building in San Francisco on the morning of your tour. Depending on the day you select, you’ll take the ferry (Mon-Fri) or a bus (Sat-Sun) to Vallejo, where you’ll then hop on a shuttle and travel north to Napa. 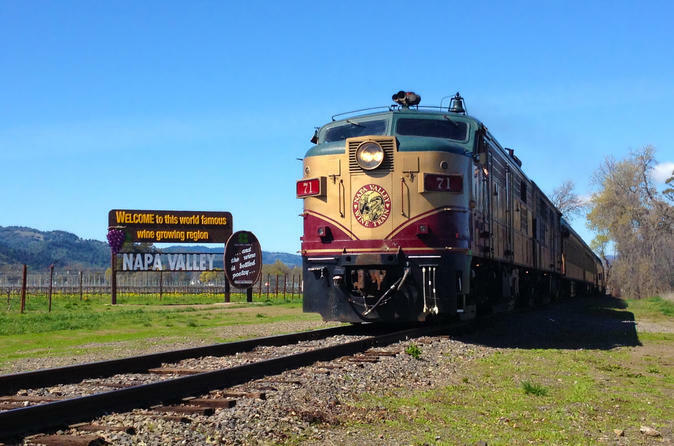 Board the Napa Valley Wine Train in downtown Napa and journey north through beautiful Napa Valley wine country. You'll be served a gourmet 3-course lunch prepared to your specifications from the highly acclaimed onboard restaurant, which uses fresh ingredients, sustainable produce, humanely raised meats and line-caught or farmed fish (see below for a sample menu). Choose from three different itineraries, listed below. Please check in 30 minutes prior to departure. All transfers and tastings are included. After your winery tour and train ride, you'll be taken back to San Francisco.